The International Boxing Hall of Fame and Museum announced today the members of the Class of 2018. Inductees include three Modern category boxers who all enter the Hall in their first year of eligibility; heavyweight champion “Dr. Ironfist” Vitali Klitschko, four-division world champion Erik “El Terrible” Morales and light middleweight champion Ronald “Winky” Wright. Non-participants and observers to be inducted include German promoter Klaus-Peter Kohl and broadcasters Steve Albert and Jim Gray. 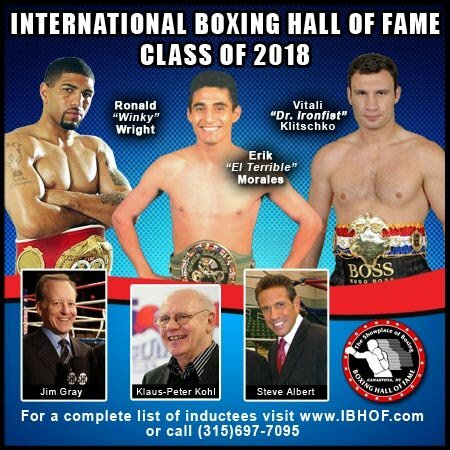 For more information on the events planned for the 2018 International Boxing Hall of Fame Weekend, please call the Hall of Fame at (315) 697-7095, visit online at www.ibhof.com, on Facebook at www.facebook.com/InternationalBoxingHallofFame and on Twitter at www.twitter.com/BoxingHall.